YouTube is one of the most popular video platforms online and the content that is posted on YouTube is watched by millions of people every day. What type of content is sure to make your YouTube channel more popular? We can see many videos on YouTube such as unboxing videos, tutorials, beauty, makeup etc. What topic should we choose for our YouTube channel to make it popular? 1. Product unboxing videos are the latest trend in YouTube content has a large number of viewers. In this type of videos, a person unwraps a new product and show what the contents are. These types of videos enjoyed by most viewers.The products that unwrapped include toys, electronic gadgets, makeup and so on. 3. Tutorials videos are also popular, and these can be computer related or learn basics of any art, course etc. 4. Product review videos are another type of videos which can be produced easily and are very useful for generating leads. Product reviews can influence the behavior of the consumer and thus are very crucial in digital marketing. 5. Vlogs are another type of YouTube channel content video which can be created easily and successfully engages the viewers. 6. Interview videos are other sure success videos for your YouTube channel. The video must feel unscripted. 7. Event videos also get a lot of traffic and are good for any brand to improve its online presence. 8. Short presentation videos by quality speakers are another type of videos that are popular. 9. Animation videos for product tutorials, landing page explanation or product and service explanation are another type of popular content for YouTube. 10. Customer testimonial videos that look genuine also attract the audience who are interested in that particular product or service. To improve video views to your YouTube Channel account, you must follow some tips and tricks. At the same time video content should be unique and trending in present generation. 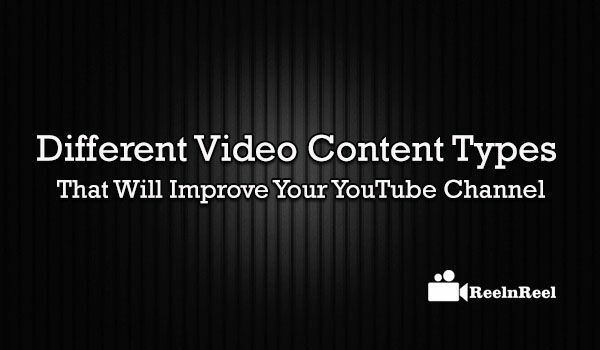 These above different video content types can helps you to grow spur YouTube Channel.